The time has come to free your inner chimp and embrace the different – say hello to the cool, compact new electric motorbike that’s set to change urban mobility forever. This is Motochimp, a two-wheeled zero emission joyride that puts fun, style and affordability on equal standing and promises to give city dwellers a completely new perspective on transportation. Launched this week at the Shenzhen International Industrial Design Fair, the revolutionary Motochimp is the brainchild of Singaporean electrics experts, Vanda Electrics, the same company behind the upcoming new Dendrobium electric supercar (http://dendrobiummotors.com). 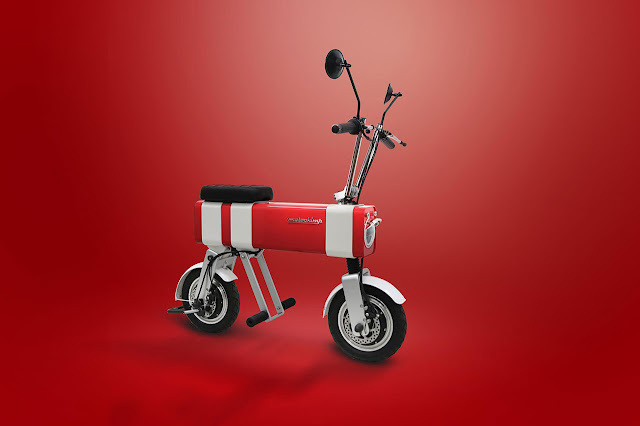 Designed from the outset to be eco-friendly, fashionable and the antidote to traditional urban transport, Motochimp offers cost-effective city mobility, capable of being fast charged from any regular AC power plug under an hour, giving you a worry-free round trip of 60km. Motochimp’s body is sassy yet classy – and it’s as durable as it is stylish. Its main structure is solidly fashioned out of extruded aluminum alloy (6061) for a smooth texture and clean finish that feels as good as it looks. Choose from red, blue or yellow and then let your imagination run wild by customizing to your heart’s content. With Motochimp, small is most definitely beautiful. 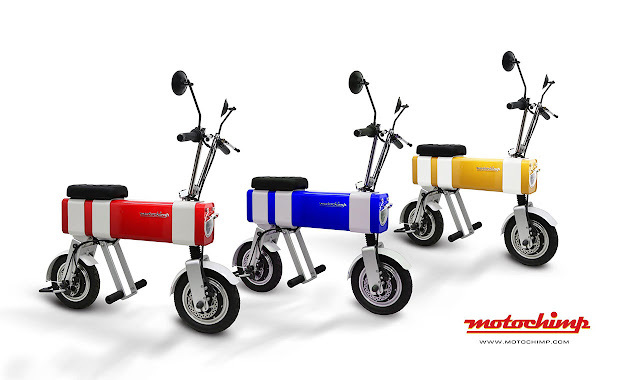 Each Motochimp is very compact measuring just over a metre long. A small wheelbase of 750mm, allows the rider to safely steer around crowds and busy walkways. 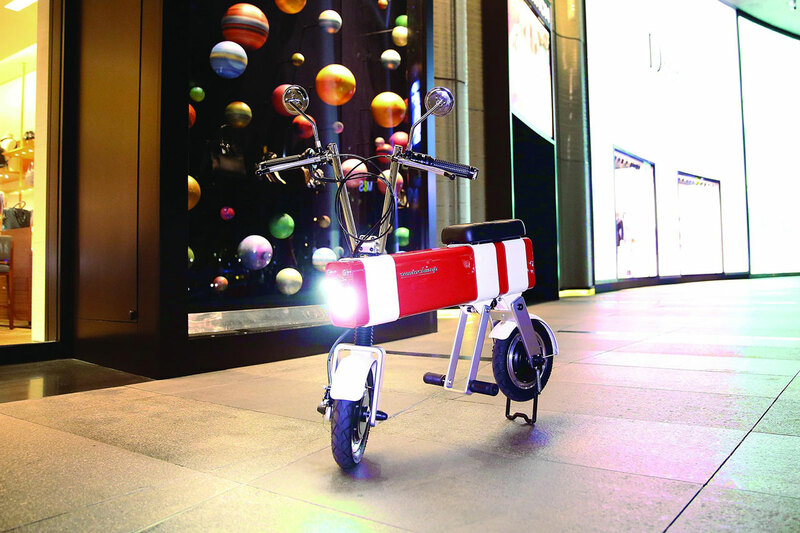 Power comes from a 48V 350W electric rear hub motor, which accelerates the Motochimp to comfortably reach cruising speeds of 30kmh. Energy is stored by a lithium-ion battery with a charge time of just 60mins from a standard home socket. 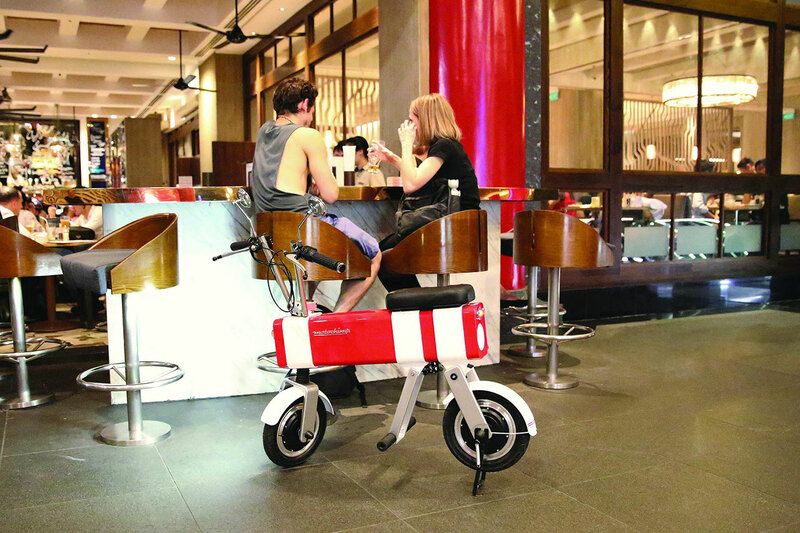 This fast-charging cycle means that Motochimp easily fits into busy urban schedules, capable of charging fully in a lunch hour, ever-ready for fast and frequent travel. Motochimp is full of surprising and delightful features too. There’s no bulky charging cable, for instance, just a fuss-free standard AC power plug that fits snuggly under the rider’s seat. And when it comes to starting Motochimp, out goes the traditional key, replaced by a contactless digital ignition lock. Using RFID technology, owners simply hover their digital ‘key’ over the transponder. Each pair has a unique digital ID code ensuring the Motochimp responds only to the owner. Finally, keeping an eye on your speed at a glance is easy thanks to a mini speedometer located on the handlebars next to the throttle, featuring a bright and easy-to-read display interface. 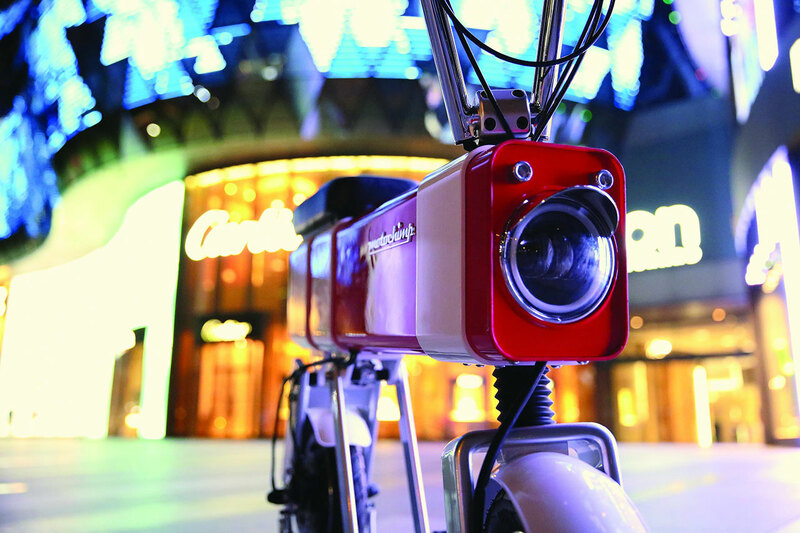 Motochimp goes on sale first in Japan. Entry into other parts of Asia, UK, and Europe is also planned. Prices will start from USD 2,000. 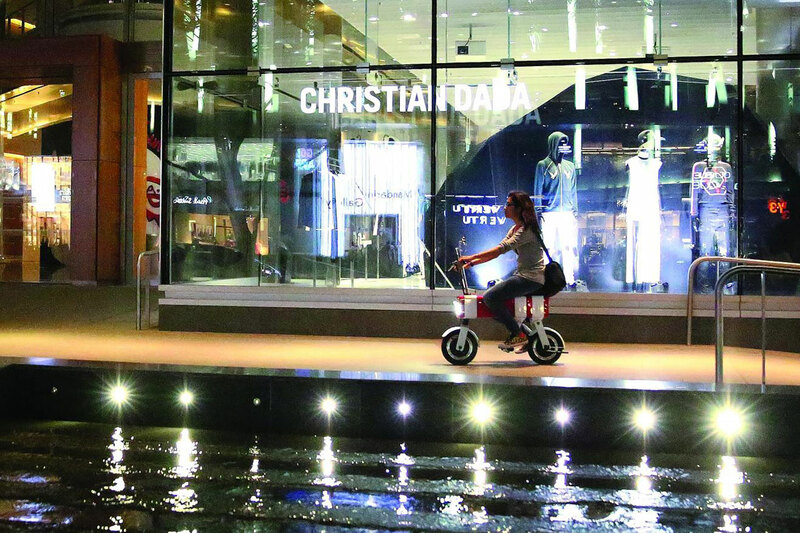 Vanda Electrics CEO Larissa Tan, explained: “Motochimp really celebrates the indie spirit of spontaneous urban mobility. It’s sustainable yet sassy, cost-effective yet cool, eco-friendly yet bursting with personality. 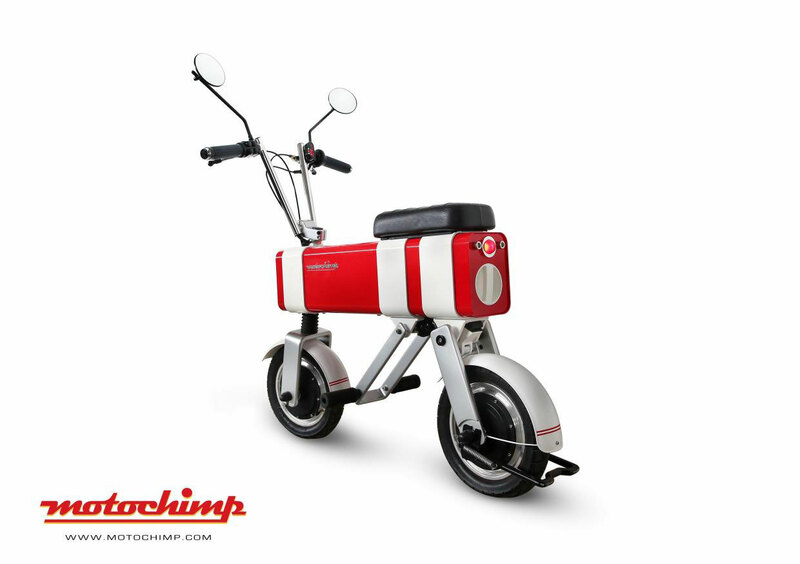 “In designing Motochimp, our original concept was inspired by a sketch from a 10-year old girl. When you’re on the Motochimp, you put enchantment back into everyday life, you see fun and wonder through the eyes of a child. We’ve really let our imaginations run free and we’re very proud of the results.